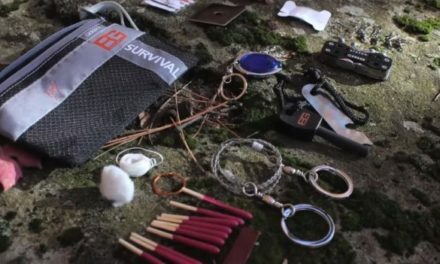 New Bear Grylls backpack and gear coming soon? I finally was able to finish Ghost Flight by Bear Grylls! It took a while for me to get. I had to wait for it to be available in the Library. Since I’m still in New Zealand at the moment, I didn’t want to purchase a copy until I got back home. Ghost Flight was actually really great. It kept me intrigued and wanting to keep turning the pages – which, to me, makes a great book. I actually didn’t have very high hopes for the book. That’s not meant to disrespect Bear at all. I absolutely love his other books that I’ve read. Mud, Sweat & Tears is one of my very favorite and most inspirational books that I’ve ever read. I know Bear is a great author, but I worried that this book might be a case of paying a celebrity to use their name and hoping the book sells. By the way, Orion Publishing paid Bear Grylls £1 Million for this series of books following the adventures of the Will Jaeger character. Quite an amazing gamble for a fiction series. It’s still unclear how much Bear wrote and how much co-author, Damien Lewis, wrote. I have never read (or heard) of anything Lewis wrote previously, so I was left with very little expectations. I honestly thought that the book would overemphasize survival skills so much that it would be a bit exhausting. But from the very first chapter, I was captivated. The writing was great, I thought the story was well done, and it made me really like Jaeger and excited for the next book in the series! SPOILER ALERT – Don’t read any further if you haven’t read the book! The only complaint I have with the book is the odd situation with Jaeger’s wife and child. During the events in Ghost Flight, Jaeger’s wife and child were missing for 3-4 years… at the end of the book, it’s revealed who kidnapped them, but what kind of kidnappers hold hostages for so long without any agenda during that time? It’s deflating to think about how long they have been captive. I also found it a bit strange that for someone who cared so much about his family, chose to disappear to a remote island in Africa for years while the fate of his family was still unknown. I can understand losing hope and assuming they were dead, but how can he decide to completely disappear, unable to be contacted or hear from anyone at all. We do know there will be more books to the series. As it says at the very end: “Will Jaeger will return”. 🙂 So perhaps we will get a better understanding of the events that occurred after his family was taken. It would also be great to hear more backstory about Jaeger in future books. I certainly would have preferred that Jaeger was able to save his family by the end of this book, but I always prefer happy endings. 🙂 I can’t help it. You can definitely tell that Jaeger did share a lot in common with Bear. It was also quite surprising to hear the stories a few weeks ago about how Bear found out that his Grandfather was a special “Nazi-hunter” in World War II. It seems that the adventures of Will Jaeger were inspired by that find. Jaeger’s grandfather in the book held the same position as Bear’s grandfather. Overall, I really enjoyed the book. It was a pleasant surprise to like the book so much. It left me excited for the next book. Bear Grylls announced today that his new book, Ghost Flight is now available for preorder in the United Kingdom in Hardcover and Audiobook. This is Bear’s debut thriller, adventure fiction novel that is set to come out June 15th. My first question that I have to ask is how in the world does he find the time to do all of the things he does? I have become a big fan of the books Bear has written. They are fun, inspirational, motivating and offer a true insight into a remarkable life of an honorable and inspirational man. His books are easy to read and have kept my attention. I wonder if that will translate well in his attempt at a fiction novel. Here is a brief synopsis of what this book will be about. The story follows an ex-soldier, SAS survival expert, and hero called Will Jaeger. I certainly can’t blame Bear for using this model for Jaeger. At first I thought it was a bit too easy, but if this means that Bear will introduce some fun, cunning and perhaps educational ways to survive in tough situations, then I would quite enjoy that. It is what he does best, after all. Jaeger sounds like a very serious and troubled man from the book description. It is unclear why his wife and son were abducted and murdered and it is unclear why he is leading an expedition into the Mountains of the Gods in the Amazon Jungle, but it seems they end up somehow being connected. I wonder if he realizes this before agreeing to the expedition. His expedition will be with a team of former elite warriors. It’s also apparent that there will be people out to stop them. Will this mean gun fights? Tricksy survival and trap tactics? It’s all quite curious and certainly sparks my interest. My only hope for the book is that it is well written and better than the typical adventure novels that are based on famous movies or video games. Note: It seems as if Will Jaeger was previously going to be named “Dan Ranger” as he mentions. It also appears that the book is co-authored by a Damien Lewis. You can read more about the upcoming series and the enormous amount of money Bear received to write the books on Orion’s website and an article in The Guardian. No word yet on whether Ghost Flight will be available anywhere outside of the UK or if it will be available on Kindle. Considering Bear is probably more famous outside of the UK, I certainly hope this book will become more widely available. I will certainly keep an eye on it and let you know of any new details about the release or any more plot details. UPDATE – May 3 – It looks like the book is being released all over the WORLD!! Head to the store to order your copy of Ghost Flight in Hardcover or Paperback! What do you think of Bear Grylls writing an adventure novel? Are you excited about it? Gryllers.com is an unofficial fansite and community dedicated to Bear Grylls. We are not associated with Bear or his management. All information and material found on this site is for entertainment purposes only. I do not claim ownership over any images or media found at this site. All material is copyright to their respectful owners and no copyright infringement is intended.